It is not everyday landscaping leads to photography. My house was built in 1950 as a new development for military men and women returning from service. Over the course of (nearly) 70 years, there have only been 2 other owners. The house had nice landscaping with a considerable amount of curb appeal. As is the case with many homes, the house needed some updating. Upon closer inspection, it became obvious the property needed a little tender loving care as well. Surrounding the house and garage is a rock garden. Over the years, grass and soil had overrun the liner and masked where the lawn ended and the rock garden began. In fact, at one point I didn’t even know a liner existed. However, I did notice a black liner peaking out of the grass and took it upon myself to dig it out by hand. Over the course of several weeks, rock and soil were removed and a grass-line (and liner) were rediscovered. One day while digging rocks out of dirt, I pulled out a tiny black toy boot out of the soil. It looked as though it once belonged to a Barbie doll. The vintage high heel boot had been hibernating 4-5 inches into the soil, along the lawn-side of the rock bed’s liner. The discovery peaked my interest, however I was in work mode and decided to stay focused on the project at hand. The family that previously lived in our home had occupied the house for nearly 60 years. They raised three girls who shared the upstairs of the 1.5 story house. While not confirmed, it seems likely one of the girls lost the Barbie boot while the original rock garden was installed. After wrapping up my work, I decided to show my wife the work that had been done…and the decades old toy boot. The boot seemed to be packed with dirt. I tapped the boot against a metal rail to remove the dirt. 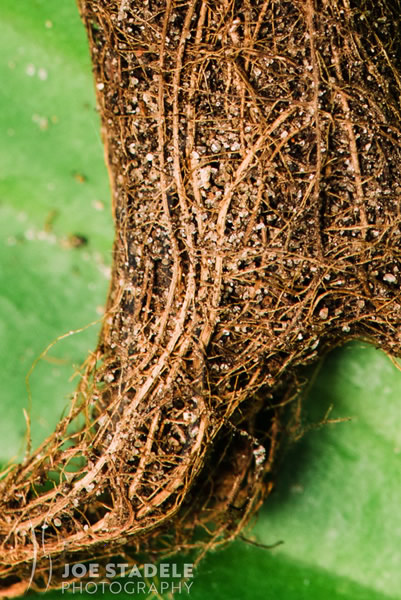 Then, all of a sudden, a tiny root system popped out. 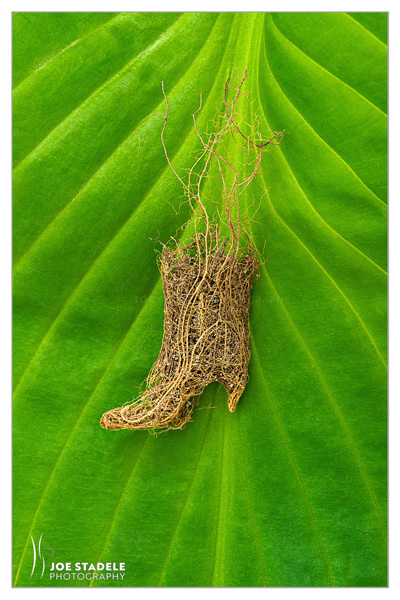 The root system strangely kept it’s shape to reveal a stiletto bootie. 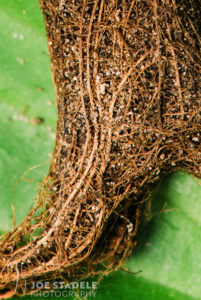 (It is beyond me how the root system kept its shape.) The roots were packed with particles of dirt, however it was all very fragile. I made the spur of the moment decision to document the roots. 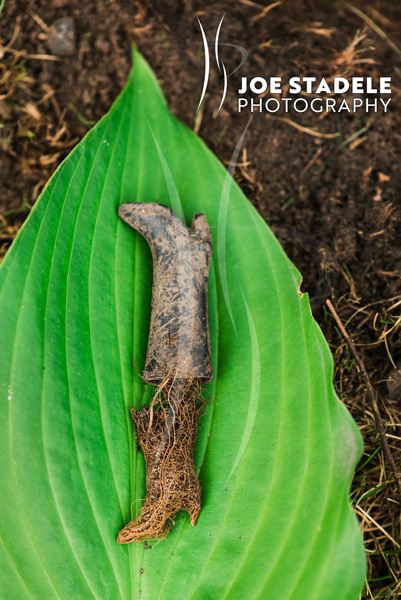 I broke off a Hosta leaf and head indoors for a Sunday night photography session. I quickly turned the kitchen into a mini-studio; grabbing white board. a Nikon camera (plug), a Macro 120mm Nikkor Lens (plug), and two Profoto strobes (shameless plug). With tweezers, I carefully positioned the boot and blew away the continuous dirt particles that presented them self under the macro lens. After feeling satisfied with the results of the Hosta leaf, me being me, I decided that I should try other grainy surfaces. As it turns out, intuition reigns supreme. 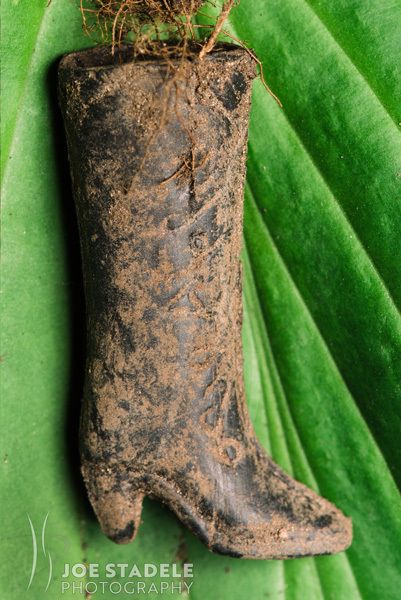 The vintage Barbie boot and “Root Boot” still exist and are kept together in a safe spot. It fascinates me how much can be lost in a generation or two. I am curious if the boot would jog the memory of the three sisters that once played around our house. Regardless, findings like this are fun reminder to take time and observe the surroundings. Expect the unexpected…or at least be open to possibility.While generations and their toys will pass, nature is consistent and will reclaim its course. 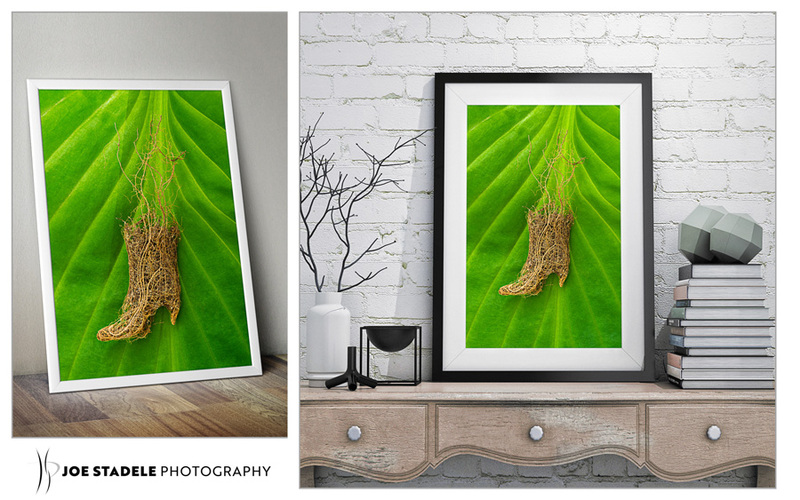 Prints of the Root Boot are available today!